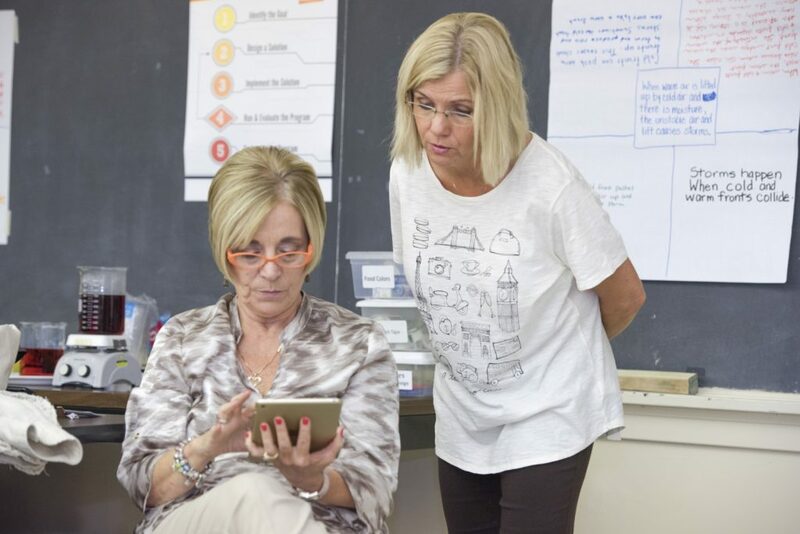 Charlotte Norberg, South Conway County School District teacher, (sitting) reviews content with Dr. Debbie Dailey, College of Education assistant professor, during a workshop at the University of Central Arkansas STEM Institute. The University of Central Arkansas STEM Institute has received several grants that total $359,547 during the 2016-2017 academic year. One of the grants the STEM Institute received was $57,780 grant from the U.S. Department of Education. The grant was funded by the federal No Child Left Behind Act and flowed through the Arkansas Department of Higher Education (ADHE). Dr. Uma Garimella, director of the STEM Institute, said the grant, titled “Blending Mathematics and Science,” is being used to train 20 teachers, grades five to eight, from the South Conway County and Little Rock School districts. Professors from the UCA departments of Biology, Mathematics, and Teaching and Learning provide teachers with 60 hours of professional development training to use integrated math and science to energize their classroom teaching and to improve student understanding, interest or involvement and ultimately, achievement. Another grant to the STEM Institute is for $6,600 from the Arkansas STEM Coalition to promote STEM education in classrooms grades three through six through the purchase of science equipment and supplies. The STEM Institute mathematics and science specialists provide the professional development necessary to increase the teachers’ content and instructional skills in math and science. Funding for the two science specialists was provided by an ADHE grant of $173,000. The STEM Institute also received a $122,167 grant with the Arch Ford Educational Cooperative to create a partnership with five high-need school districts, Catholic Schools of Arkansas and Academic Plus Charter School. The program proposes to develop science initiatives, which will augment learning progressions to support the new Arkansas science standards to improve science instruction in grades kindergarten to four. The goal is to enhance teacher content knowledge and teaching skills that prepare students for success through developing a vertical team to integrate science, mathematics, literacy, technology and embracing project-based learning.